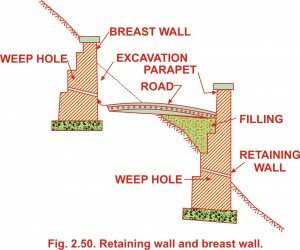 Retaining walls and Breast walls, Retaining walls,Retaining wall Terminology,Back fill,Back fill slope,Batter,Dowels,Footing, Footing key,Weep wholes, Grade, Heel, Horizontal temperature/shrinkage reinforcing, Keyway, Principal reinforcing, Retained height, Stem, Surcharge, Toe, Breast Walls. The walls constructed for retaining or supporting earth against their back are called retaining walls. Earth cannot remain vertical but would be in a state of equilibrium when it assumes a natural angle which is called angle of repose. If it is desired to be retain the earth vertically, that portion of the earth will have to be supported by a wall called retaining wall. 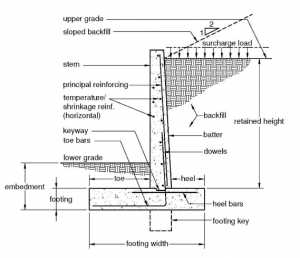 The back of the wall is in the form of steps and the face of the retaining wall may be either vertical or battered. The width at the base will depend upon the height of earth to be retained as the more the height, the greater will be the pressure at the base and the top can be kept 2 bricks thick . The soil placed behind a wall. Often the backfill slopes upward from the back face of the wall. The slope is usually expressed as a ratio of horizontal to vertical (e.g. 2:1). The slope of the face of the stem from a vertical plane, usually on the inside (earth) face. to the required development length. That part of the structure below the stem that supports and transmits vertical and horizontal forces into the soil below. A deepened portion of the footing to provide greater sliding resistance. The surface of the soil or paving; can refer to either side of the wall. That portion of the footing extending behind the wall (under the retained soil). Longitudinal horizontal reinforcing usually placed in both faces of the stem and used primarily to control cracking from shrinkage or temperature changes. A horizontal slot located at the base of the stem and cast into the footing for greatershear resistance. Reinforcing used to resist bending in the stem. The height of the earth to be retained, generally measured upward from the top of the footing. The vertical wall above the foundation. Any load placed in or on top of the soil, either in front or behind the wall. pressure against the wall. Unless properly designed and maintained, weep holes seldom “weep”. to provide drainage of the back fill.